Kick off your visit on the 13th (Sat): take in the spiritual surroundings of Shantaleswara Temple, take in the spiritual surroundings of Basadi Halli, then take in the spiritual surroundings of Hoysaleswara Temple, and finally delve into the distant past at Halebidu Temple. To find other places to visit, more things to do, ratings, and tourist information, read Halebid travel itinerary planner. Mangalore to Halebid is an approximately 4.5-hour car ride. Finish your sightseeing early on the 13th (Sat) so you can travel to Channarayapatna. Channarayapatna is a town and taluka in Hassan district of Karnataka, India. 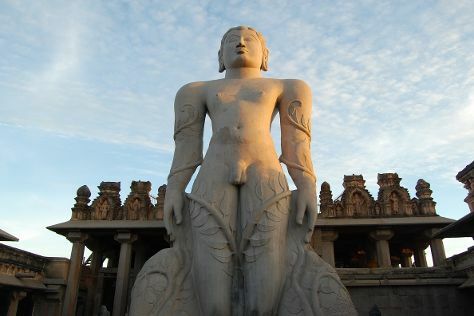 On the 14th (Sun), contemplate in the serene atmosphere at Shravanabelgola Jain Temple. To find ratings, other places to visit, traveler tips, and more tourist information, read our Channarayapatna road trip planning app . Traveling by car from Halebid to Channarayapatna takes 1.5 hours. In October, daily temperatures in Channarayapatna can reach 31°C, while at night they dip to 23°C. Finish your sightseeing early on the 14th (Sun) to allow enough time to travel back home.